Bernie Sanders smiled as a bird landed on his podium at a Portland, Oregon rally in March. AUSTIN, Texas — Election season 2016 has been going for roughly a thousand years and you have my complete sympathy if you feel as if you’ve been through an emotional, mental and spiritual shredder. It may seem, through sheer weariness over the process of electing a new president all these many months, that everything related to it is a complete bummer. That the online world has turned into a fetid, spiraling cesspool reflecting our national mood. And while there are certainly stinky and awful pockets of online activity that have brought out the worst of America, I’m here to remind you that it hasn’t been all bad. In fact, some of what us online dwellers have seen this year has been pretty great. Often funny, occasionally inspiring, and even educational once in a while. 1. Memes, memes, memes. If there’s one thing the internet, and particularly social media, got right this year it was churning out humor at a faster and faster pace. The insta-meme phenomenon seemed to peak during the three presidential debates, when any off-kilter or oddly placed phrase become sudden fodder for the web’s meme machinery to go into overdrive. “Bad hombres,” “Trumped-Up Trickle-Down Economics,” Hillary Clinton’s private email server saga, the phrase “nasty woman” and taco trucks on every corner became T-shirts, animated GIFs, comedy sketches and calls to action in the blink of an eye. Of courses, memes weren’t just fun and games this year; some were also used in less comedic ways. 2. That brilliant Mary J. Blige/Hillary Clinton tweet. Nothing captured the absurdity of celebrities inserting themselves into the electoral process better than a tweet from MTV News writer Doreen St. Felix that showed a screenshot from an awkward interview between singer Blige and candidate Clinton. 3. A new standard for quick fact-checking. Faster internet connections don’t just mean better Netflix streams for the masses, it means we expect more information to reach us more quickly wherever we are. And in an election year that perpetuated lots of half-truths, misleading information and outright lies, it was nice to see Snopes, NPR’s real-time debate fact-checker, PolitiFact and even traditional news outlets such as The Washington Post and The New York Times reassert their relevance on political coverage. 4. Podcasts dig deeper into political dialogue. Speaking of NPR, its “Politics Podcast” led a strong group of audio content that included Slate’s “Political Gabfest” and “Trumpcast,” “The Run-Up,” Vox’s “The Weeds” and “FiveThirtyEight Elections.” The opposite of sound-bite journalism, podcasts allowed for longer, more nuanced (and blessedly free of histrionics) discussion over an hour or more at a time. 5. Culling friend lists on social networks. Trimming people out of your Facebook or Twitter feeds simply because you disagree with them politically can be dangerous. It can create an echo chamber where the only posts you see are from people who are in lockstep with your own views. But in extreme cases that cross over into harassment or extreme unpleasantness, social media gives many of us a window into the psyches of casual acquaintances and distant family members and presents us with a choice: Are these people we really want in our lives? 6. Viral music videos stepped it up. The debates in particular proved fertile fodder for online-video creators with music on the brain, from Epic Rap Battle’s “Donald Trump vs. Hillary Clinton” triumph to a trio of superb videos from Songify/Schmoyoho (formerly “Auto-Tune The News”). Those videos featured Blondie, “Weird Al” Yankovic and Joseph Gordon-Levitt. 7. Frank discussions about sexual harassment, assault, consent and the treatment of women online. A series of events, accusations and leaked tape involving Donald Trump and gender politics related to Clinton’s run led to serious talk online about how women are treated in America. Writer Kelly Oxford created a movement by asking women to tweet their sexual assault stories with the hashtag NotOkay, prompting thousands of responses. Social media provided a vehicle for many of these stories to be heard, often for the first time. 8. Voting tools, apps and games nudging us online. If you got a reminder from Google or Facebook about registering to vote or participating in early voting, you were part of a wave of increasingly effective tools meant to increase participation. The simple Facebook reminder, for instance, led to a surge in registration across the country, according to election officials. Apps such as Voto Latino’s “VoterPal” aimed for the same goal while the app “Voter” guided undecided voters through their options. And games such as “The Political Machine 2016” and “President Forever 2016” educated on the electoral process through video gaming. 9. Birdie Sanders. One of the great (but often annoying) things about the internet is its ability to hone in on some seemingly minute detail and turn it into A Thing. (SEE ALSO: debate-question-asker Ken Bone.) 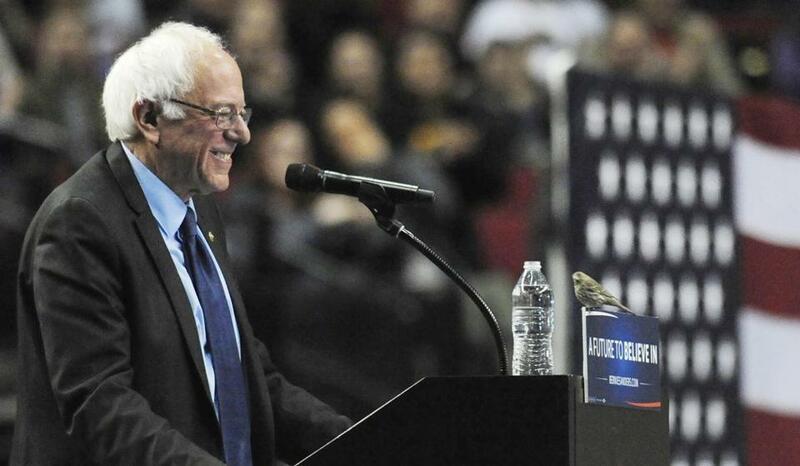 In the case of “Birdie Sanders,” it was a bird that flew onto a podium during a Bernie Sanders rally. Unexpected online stardom followed for the little fella. 10. First-time voters on Instagram. Maybe this is me in dad mode getting pre-emptively nostalgic for the future, but it always gave me a happy little thrill to see photos posted by proud parents or by young people themselves showing first-time voters with their “I Voted” stickers. Last I checked, there were 23,755 photos on Instagram with the hashtag FirstTimeVoter. And that’s pretty inspiring.